I've worked in my room for a couple days so far. We don't actually start school until the Tuesday after Labor Day. But, we have open house the week before school starts. 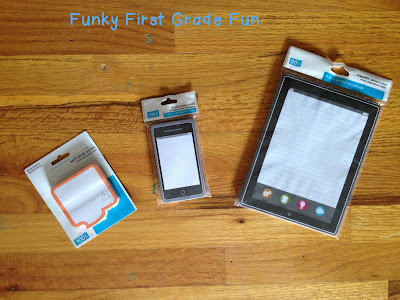 I was super excited to find these speech bubble and iphone sticky notes at Walmart. I also bought the ipad notepad, but it is not sticky. I'm sure I can think of something fun for my kids to do with all of these. 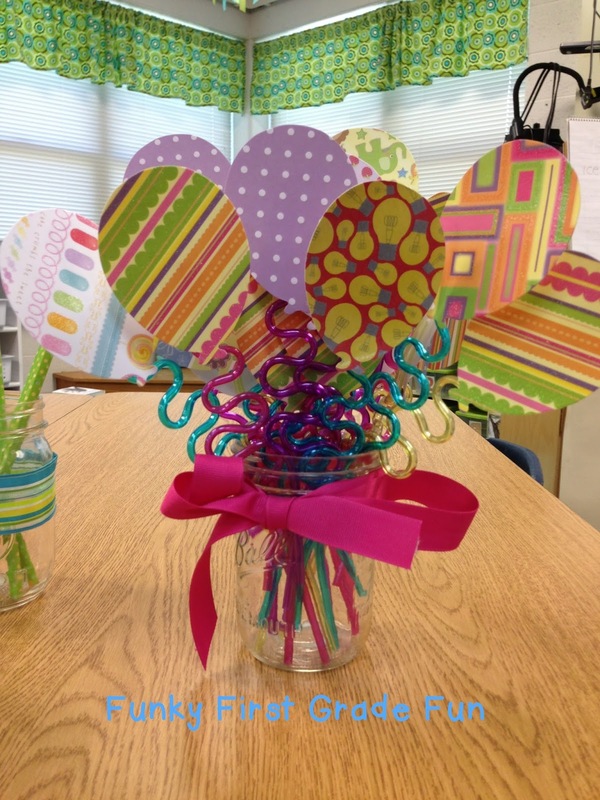 You can read an old post about how I celebrate birthdays in my room here. 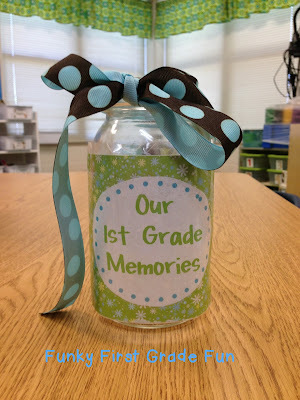 You can read a post about how I use the memory jar here. My assessment binders. Ughh. Last year was the first year that I used an assessment "binder". 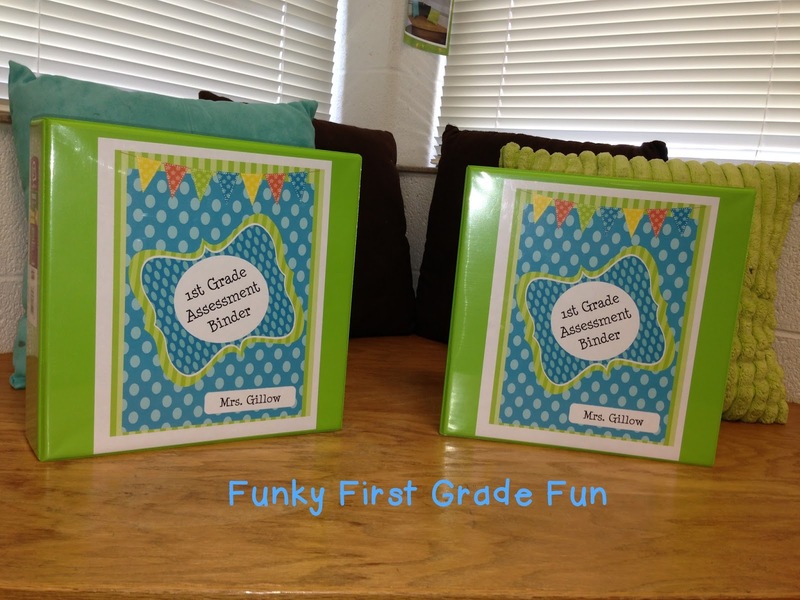 in separate file folders neatly organized in an assessment crate. EVERYONE else used these giant binders. I folded. I caved. I decided to try "the" binder. I didn't like it much. I preferred my folder system. wrote some very nice things in my evaluation about my assessment binders. So, I guess I'll use this system again. Why do I have two assessment binders? I refuse to be the victim of an assessment binder volcano incident. and all of your hard work gets mixed together and results in a two hour resorting project. They are labeled on the side. I do not like to share my pencils with students. I am happy to give them a pencil to use/chew on/lick...but I like my pencils clean. So, I have a teacher only pencil jar on my desk (my pencils are decorated with washi tape). We are starting a new math program this year (the Common Core version of Everyday Math). 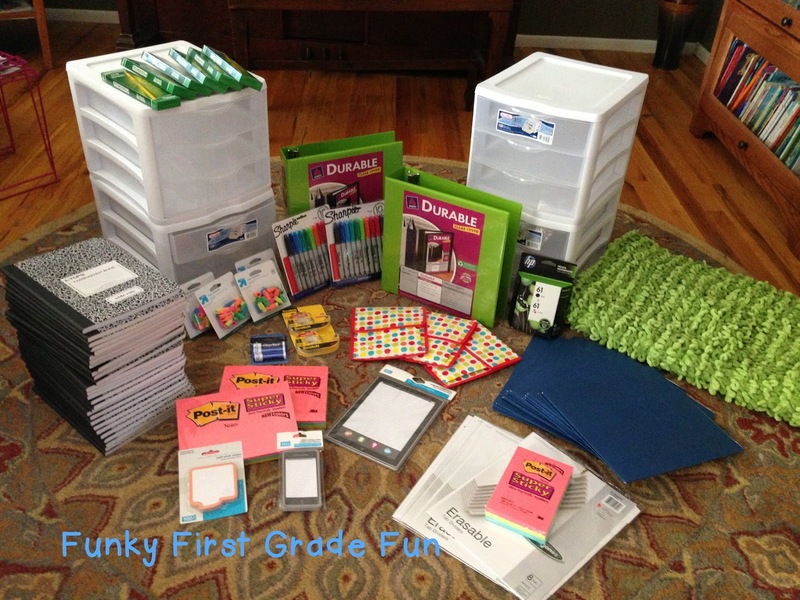 I will have math tool kits at each table for my students to use this year. The math tool kits will start mostly empty, and we will add tools as they are introduced/needed for different lessons/activities. In addition to all of that, I reorganized my word work games (picture coming soon), worked on my year long planning, reorganized the poem and updated my choices for the poetry books my students make throughout the year and poured over the first two years of our new math program (hooray!). Next on my list is to prepare all the open house stuff and refile the pile of stuff from last year that I keep avoiding. Thank you for taking the time to comment! I might have to get some zebra tape! Hi! I'm a new blog follower of yours. I love your memory jar idea as well as the way you organize your assessment binders. I'm thinking of going back to binders this year as well because, just as you wrote, everyone else uses assessment binders. It's hard not to follow sometimes!!!! I love the school supplies you have purchased already...all of those are staples in my classroom too! Thank you for following! Let me know how your assessment binders work if you decide to use them. Thank you, Kimberly! I definitely will. I'm thinking I'm going to...it might be easier for my maternity leave substitute rather than teach her my method to filing. Ugh. I cannot STAND to use pencils that have been chewed! I use the black Ticonderoga pencils as "my" pencils, and they kids can have everything else. Also, love the assessment binder idea!! My least favorite thing about having a sub is when they hand out MY pencils to the kids. And...the kids use them as if they have not been told every single day that those are "Mrs. Gillow's special pencils". :) Thanks for visiting my blog today! 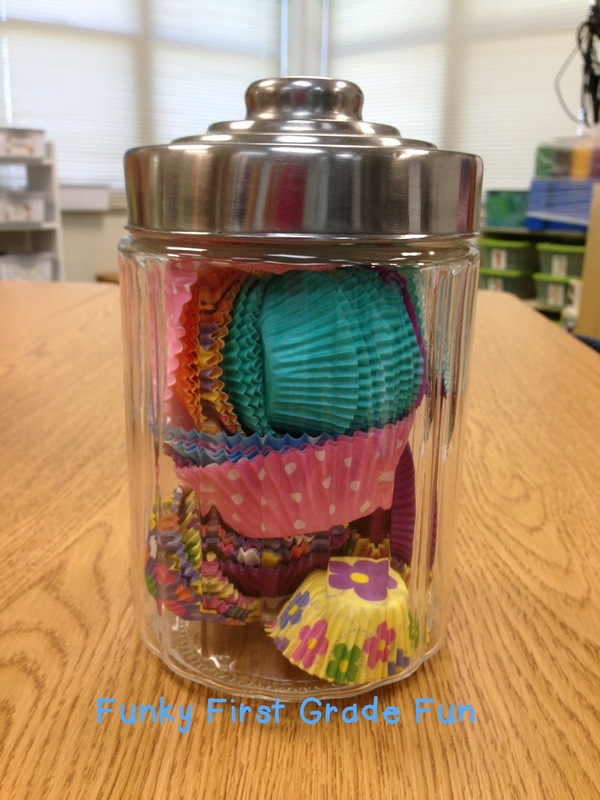 I love your jar with cupcake liners for birthday treats! Such a cute idea. I never thought of that. Thanks, Tanya! I think my students are more excited to pick out their cupcake liner than they were to actually eat a cupcake back in the days before our cupcake law. Ha! 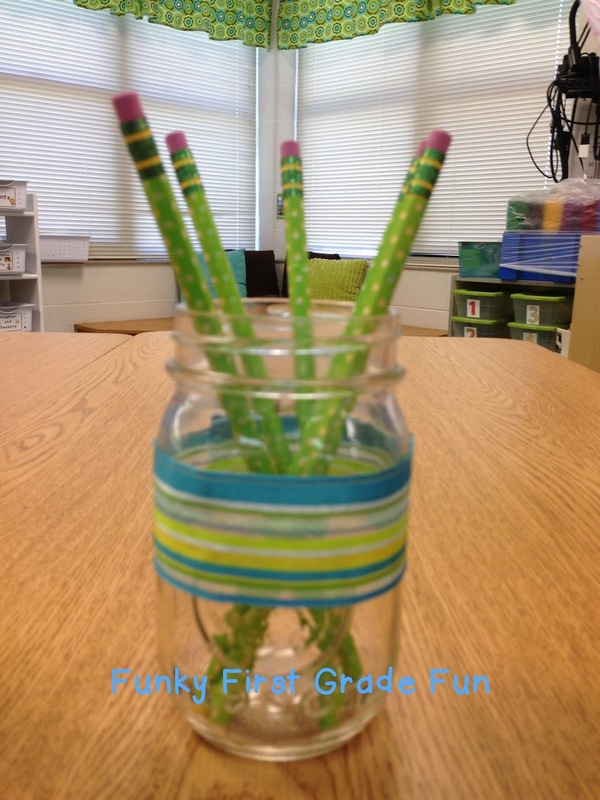 I love your math tool tubs! Where did you get your number lines? I made the number lines. 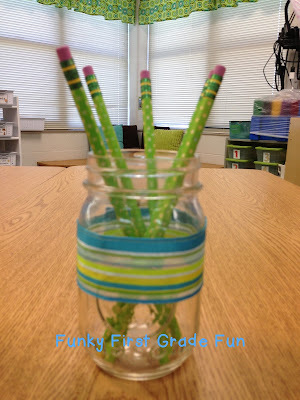 I have a laminated set and then I unlaminated copies in the tubs for kids to use/write on/take home. I posted them as a freebie long ago. You can find the here. 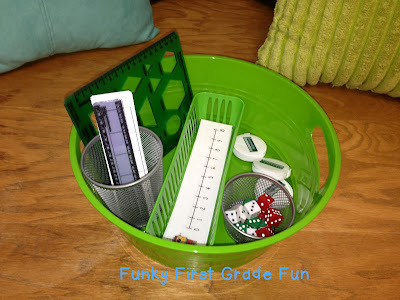 Hi, those green math tool tubs are great. Where did you buy them? How about the long green baskets inside of them?